Want to learn about San Francisco, its life and history? Visit the Maritime Museum for interesting exhibits and seafaring artifacts or play some of the turn of the century (that's 1900, not 2000) games at the Musée Mécanique on Pier 45. 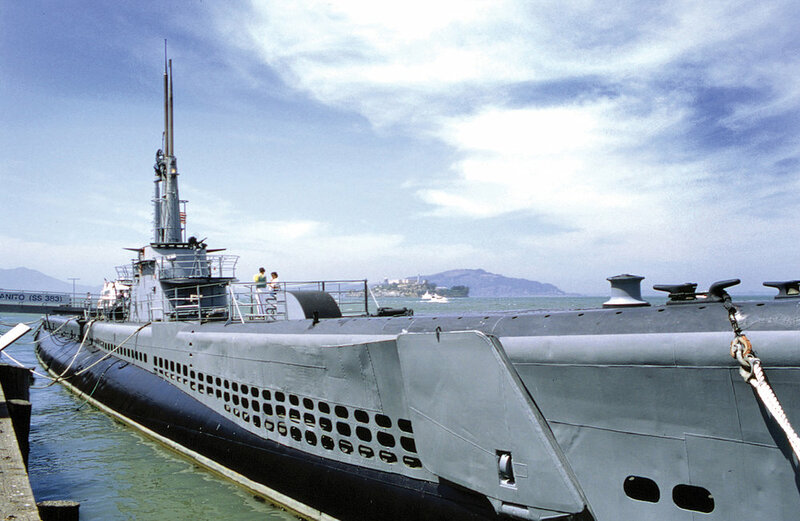 Take a deep breath and go down into the depths of the USS Pampanito, an original WWII submarine. Experience the historically stunning Liberty Ship, the SS Jeremiah O'Brien, docked right next to the Pampanito. Fun at the Wharf also includes PIER 39, the Sea Lion Center, the Hyde Street Pier, Ghirardelli Square, the Aquarium of the Bay, Madame Tussauds, and much, much more! 2 Great Attractions in 1 Location! DarkRide: Experience the thrill of a rollercoaster and the excitement of a state-of-the-art laser-blasting game at 7D Experience. A 20-seat theater, massive movie screen and the newest 3D technology will awaken your senses as you Ride, Blast and Compete your way through other dimensions! Laser Maze Challenge: Put your agility, speed and confidence to the test as you navigate your way through a web of crisscrossing laser beams. Attempt this mission solo or work in tandem as you jump, crawl and stretch yourself to the limit to beat the clock and your friends. Beam Busters provides a new twist to the Laser Maze Challenge. Instead of carefully navigating the crisscrossing beams, you will be tasked with intentionally trying to break as many laser beams as you can in a specific amount of time. Sound easy? Well it’s not! You’ll be running, leaping and flailing around to beat the highest score! No trip to San Francisco’s Fisherman’s Wharf is complete without a trip to Alcatraz Island. From the many vantage points along the piers at the Wharf, you’ll be able to see some remarkable views of this 22-acre island. The Island is run by the National Park Service who contracts with one operator, Alcatraz Cruises, to ferry people to and from the island. They depart from Pier 33 and tickets usually sell-out 2-3 weeks in advance so plan ahead! If you simply want to cruise around the island, both Blue & Gold Fleet (PIER 39) and the Red & White Fleet (Pier 45) include this in their Bay tours. Explore the magic, beauty and wonder of San Francisco Bay at Aquarium of the Bay. Located at the water’s edge, 20,000 local sea creatures await you. Your visit will take you through three main exhibit areas that display the amazing riches that lie beneath the surface of the San Francisco Bay and surrounding waters. See eye-to-eye with a Sevengill shark, be mesmerized by moon jellies, and touch a bat ray’s wing. Walk through crystal clear tunnels and watch San Francisco Bay’s most amazing animals swim overhead. Connect to San Francisco Bay through daily naturalist-led animal feedings and interactions, hands-on science experiments, sustainable seafood discussions and more. Enjoy viewing Alcatraz and the Golden Gate Bridge from our outdoor decks. Aquarium of the Bay is open 364 days a year. Daily special events include animal feedings, naturalist presentations and behind-the-scenes tours. Admission is $22 for adults, $13 for seniors (65+) and children (3-11). Children under 3 are free. Families save with the Family Pack, priced at just $64 for two adults and two children. Upgrade your general admission ticket to an exciting Behind the Scenes Tour for an additional $10 for members and $12 for non-members. This permanent exhibit features three North American River Otters and educates guests about the importance of the health and conservation of our natural resources. The SS Jeremiah O'Brien is one of two remaining fully functional Liberty ships of the 2,710 built and launched during World War II. The O'Brien has the distinction of being the last unaltered Liberty ship and remains historically accurate. Moored at Pier 45, Fisherman's Wharf, she is a premier San Francisco attraction. A living museum on the National Register of Historic Places and a National Historic Landmark, the O'Brien transports you back almost seven decades to when sailors braved the harshest of high seas and threat of enemy attack. Located at the west end of Fisherman's Wharf, Hyde Street Pier is home to the fleet of historic landmark vessels in the collection of the San Francisco Maritime National Historical Park, which is a unit of the National Park System. For a modest admission fee, visitors can board this fleet of turn-of-century historic ships. The Park offers educational, music and craft programs for all ages, and provides unique opportunities for learning more about our nation's maritime heritage. Enjoy hands-on exhibits, waysides, videos and Ranger-led tours. Access to Hyde Street Pier itself is free, offering breathtaking views of the San Francisco Bay and the Golden Gate Bridge. Fisherman's Wharf's newest attraction! Experience the World Famous Madame Tussauds from London! No ropes or barriers – get close to your favorite stars! Photograph and mingle with A-Listers, challenge your sports heroes, hop on stage with your favorite pop stars and get up close with a range of fun, interactive experiences with the world's best known personalities. So who do you want to meet? See website for current hours of operation. Across the street from Ghirardelli Square, in the beautiful setting of Aquatic Park, the historic Maritime Museum building looks out over San Francisco Bay, with sweeping views from the Golden Gate Bridge to Alcatraz Island. Built in 1938 as a WPA economic recovery project, the museum building is a marvelous example of Art Deco style, and includes fanciful mural paintings and unique architectural motifs. The museum houses some of the Park's thousands of nautical artifacts, models and exhibits. It also serves as a stunning venue for outside events: weddings, meetings and gala celebrations. Cross Streets: Beach and Polk Hours of Operation: Open daily from 10:00am to 4:00pm. Amusing America is the story of participatory commercial amusements in American cities - San Francisco in particular - and how they changed American life. This free attraction at Fisherman’s Wharf invites residents and visitors to take a roller coaster ride into history. From the Gilded Age of the 1800’s and ’90s to World War II new entertainment like world’s fairs, amusement parks, Ferris wheels, dance pavilions, arcades and swimming baths changed the way Americans lived. The Musée Mécanique is one of the world’s largest privately-owned collections of mechanically operated musical instruments and antique arcade machines, featuring everything from turn of the century hand-cranked music boxes to modern video arcade games. Hours: 10am-7pm weekdays and 'till 8pm on weekends. The Museum of 3D Illusions is founded as a place to let the mind soar through a world of optical illusions. A visitor to the Museum of 3D Illusions is not a passive observer but a full-fledged participant of the paintings created by some of the world’s best artists. We’re not like other museums, the 40+ exhibits you will see are completely interactive and yes, photography is highly encouraged! The San Francisco Maritime National Historic Park Visitor Center, housed in its 1908 historic brick cannery warehouse at the corner of Jefferson and Hyde Streets (also home to the Argonaut Hotel), is filled with interesting maritime interpretative material and unusual maritime artifacts. It includes "A Walk Along the Waterfront," a museum-quality walk-through exhibit that takes you on a stroll through San Francisco's historic waterfront, from the days of the original native tribes to the early 20th century period of industrialization. Cross Streets: Jefferson and Hyde. Hours of Operation: open seven days a week from 9:30am to 5:00pm. San Francisco's Number One Attraction! PIER 39 is home to the following attractions. Street performers are multi-talented tricksters, magicians, jugglers and comedians who entertain PIER 39 visitors daily at the Crystal Geyser ALPINE SPRING WATER Stage. Guests marvel as these zany performers bring laughter and cheer to thousands! Shows are weather-permitting and free to the public. Come try Frequent Flyers - a fun-filled bungee trampoline for all ages. Participants can safely jump up to 20 feet in the air and try their hand at some aerial acrobatics. Jumpers must be at least 30 pounds and under 230 pounds. Experience amazing fun for the whole family at Magowan’s Infinite Mirror Maze! Challenge yourself to find your way through the infinite hallways, endless circles and dead-ends of the most fascinating maze in San Francisco. Make your own music on PIER 39′s Musical Stairs, the interactive art exhibit presented by Artist Remo Saraceni, creator of the floor piano in the Tom Hank’s movie Big. 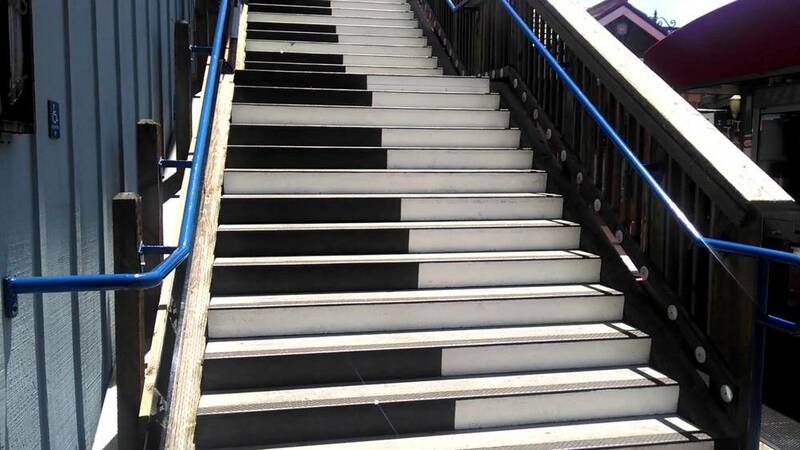 To enjoy the music, please take a walk up (or down) these magical stairs. The San Francisco Carousel, handcrafted in Italy, is intricately hand-painted and depicts famous San Francisco landmarks, including the Golden Gate Bridge, Coit Tower, Chinatown, Lombard Street, Alcatraz and the popular California sea lions at PIER 39. It is the only carousel in the country that has artistic renderings of its home city. Eighteen hundred twinkling lights illuminate this carousel, which features classic moving horses, rocking chariots, spinning tubs and swings. 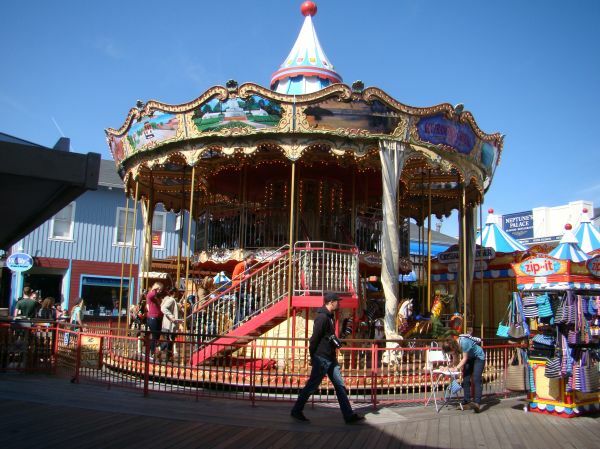 The carousel is located on the first level at the Bay end of PIER 39. The Flyer—San Francisco combines motion seats, live-action and computer-generated imagery to simulate flight, and in-theater special effects create a sweeping experience for all your senses! Launch over the Golden Gate Bridge, barrel down Coit Tower, zoom through Lombard Street and Chinatown, and soar through the Redwood National Forest. Experience the strange, the unusual, and the unbelievable! See in person the incredible “Believe It or Nots” you’ve read about and seen on television. With more than 70 new interactive and hands-on exhibits, San Francisco’s Believe It or Not! is the most interactive Odditorium in the world! It is home to more than 400 exhibits, 80% of which are new, in 18 themed galleries, with a new emphasis on the Bay Area. Get lost in the Mirror Maze, with more than 200 mirrors spread across nearly 2,000 square feet. The San Francisco Dungeon brings old San Francisco to life with a theatrical cast, special effects, gripping storytelling and an underground boat ride. The San Francisco Dungeon is NOT your usual visitor attraction. It’s hilarious fun and it’s sometimes a bit scary. The San Francisco Dungeon provides an exciting mix of 9 live actor shows, 200 years of history and 360° sets. It’s 60 minutes through 200 years of San Francisco’s authentic past. You and your companions walk through the Dungeon, moving from show to show, guided by our professional actors. The shows are based on real San Francisco history and legends (minus the boring parts!). You’ll get up close and personal with sinister characters including Miss Piggott, the Wild West saloon owner, and the infamous crimper, Shanghai Kelly. Our unique take on history has made us one of Europe's best-loved visitor attractions. San Francisco's Fisherman's Wharf is the perfect venue; filled with history, intrigue and colorful characters. See website for current hours of operation. The sea lions camped out in PIER 39's West Marina have been endearingly coined, "Sea Lebrities." These boisterous barking pinnipeds started arriving in droves, taking over the docks in January 1990 shortly after the 1989 Loma Prieta earthquake. At first they numbered from 10-50, but due to a plentiful herring supply, available dock space and the marina's protected environment, the population grew to more than 300 within a few months. Each winter, the population can increase up to 900 sea lions, most of which are male. During the summer months, the sea lions migrate south to the Channel Islands for breeding season, but in recent years a small group stays year-round at PIER 39's K-Dock. The Sea Lion Center, operated and managed by Aquarium of the Bay, is a hub for all things sea lion, including interactive displays, educational videos and many fascinating presentations led by Aquarium of the Bay Naturalists. Touch a sea lion pelt, size yourself up next to a real sea lion skeleton and more. Once you get to know the California sea lions, step outside to the K-Dock overlook and see (and smell!) them for yourself.